India’s estimated 300,000 budget private schools (BPS) are a unique phenomenon, evidence of the fierce determination of households even at the base of India’s iniquitous social hierarchy to secure a good future for their children. Sited mainly in urban slums, tier II and III towns and rural India, BPS are small, often ‘unrecognised’ schools promoted by edupreneurs to meet the demand of low-income households fed up with or distrustful of dysfunctional government schools defined by crumbling infrastructure, multi-grade classrooms, chronic teacher absenteeism, corporal punishment, English language aversion and abysmal learning outcomes. Over the past two decades, BPS have multiplied as bottom-of-pyramid households — even if not the ruling neta-babu brotherhood — have cottoned on that real education (including English language learning) is the passport to upward socio-economic mobility. Budget private schools are typically crammed into small premises — often rented — charging monthly tuition fees ranging from Rs.70-150 in rural areas, and Rs.200-600 in urban India. However the country’s sui generis BPS are facing an uncertain future with education ministry officials countrywide shaking them down or closing them for non-compliance with s. 19 and the Schedule of the Right of Children to Free and Compulsory Education Act, 2009 (aka RTE Act). This provision makes it mandatory for all schools to comply with minimal infrastructure and teacher-pupil ratio norms. According to the Centre for Civil Society (CCS), a top-ranked Delhi-based think-tank, over the past two years 2,983 private budget schools countrywide have been shut down with another 5,097 issued closure notices. Your editors believe that the best way to stem the exodus of children from free-of-charge government schools is through improvement of their teaching-learning standards rather than shutting down budget private schools. Therefore, we have opposed the provisions of s.19 particularly because government schools are exempt from its penal provisions. The reality that an estimated 60 million children — an astonishing number — are enrolled with them is proof that BPS provide parents affordable alternatives to dysfunctional government schools. 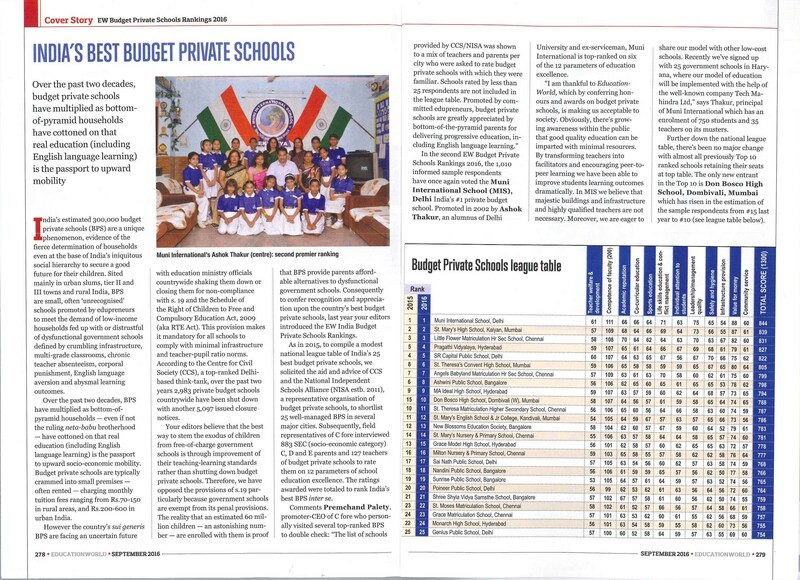 Consequently to confer recognition and appreciation upon the country’s best budget private schools, last year your editors introduced the EW India Budget Private Schools Rankings. As in 2015, to compile a modest national league table of India’s 25 best budget private schools, we solicited the aid and advice of CCS and the National Independent Schools Alliance (NISA estb. 2011), a representative organisation of budget private schools, to shortlist 25 well-managed BPS in several major cities. Subsequently, field representatives of C fore interviewed 883 SEC (socio-economic category) C, D and E parents and 127 teachers of budget private schools to rate them on 12 parameters of school education excellence. The ratings awarded were totaled to rank India’s best BPS inter se. 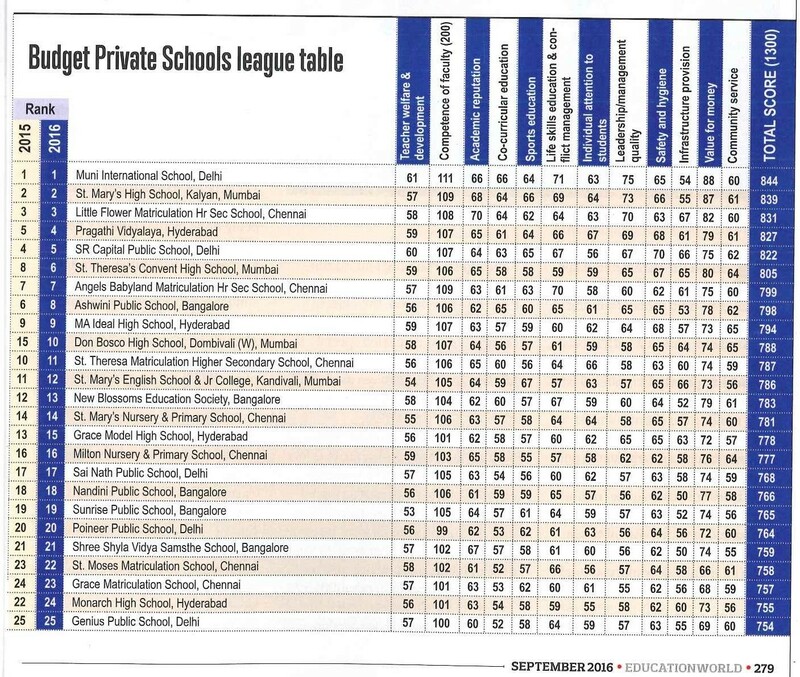 In the second EW Budget Private Schools Rankings 2016, the 1,010 informed sample respondents have once again voted the Muni International School (MIS), Delhi India’s #1 private budget school. Promoted in 2002 by Ashok Thakur, an alumnus of Delhi University and ex-serviceman, Muni International is top-ranked on six of the 12 parameters of education excellence. “I am thankful to EducationWorld, which by conferring honours and awards on budget private schools, is making us acceptable to society. Obviously, there’s growing awareness within the public that good quality education can be imparted with minimal resources. By transforming teachers into facilitators and encouraging peer-to-peer learning we have been able to improve students learning outcomes dramatically. In MIS we believe that majestic buildings and infrastructure and highly qualified teachers are not necessary. Moreover, we are eager to share our model with other low-cost schools. Recently we’ve signed up with 25 government schools in Haryana, where our model of education will be implemented with the help of the well-known company Tech Mahindra Ltd,” says Thakur, principal of Muni International which has an enrolment of 750 students and 35 teachers on its musters. Further down the national league table, there’s been no major change with almost all previously Top 10 ranked schools retaining their seats at top table. The only new entrant in the Top 10 is Don Bosco High School, Dombivali, Mumbai which has risen in the estimation of the sample respondents from #15 last year to #10. Read this news on Education World website or click here to download image version.